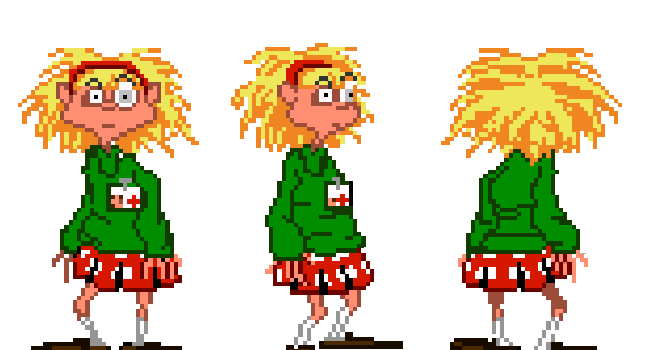 For those who never played the mid-90’s LucasArts graphic adventure game, Day of the Tentacle (a sequel to Maniac Mansion), let me be the first to say: you’re missing out, man. This game was LEGIT. A diabolical, disembodied purple tentacle tries to take over the world, portable toilets are equipped for time travel, and there’s a head-banging roadie name ‘Hoagie’. Trippy space-cadet and med-school student, Laverne, is one of the three main characters. She flutters about the screen in a gangly way with her wonky eye and wacky giggle. And eventually…she saves the day. Snag her style – complete with scalpel and nerdy protagonist-pal, Bernard.